ECE ILLINOIS graduate student Varun Badrinath Krishna’s work at the intersection of machine learning, computer security, and energy systems has earned him a spot in the Siebel Scholars Class of 2018. Krishna is also affiliated with the Coordinated Science Lab. One graduate student in the area of energy sciences is selected to the Siebel Scholars class in his or her final year of study. Krishna received his bachelor of engineering degree in computer engineering from the National University of Singapore in 2010. As part of that program, he was selected to participate in an entrepreneurship immersion program in Silicon Valley for a year, during which he interned at a technology start-up company and took entrepreneurship classes at Stanford University. It was through Cleantech events in Silicon Valley that he got excited about the applications of computer science in energy science. 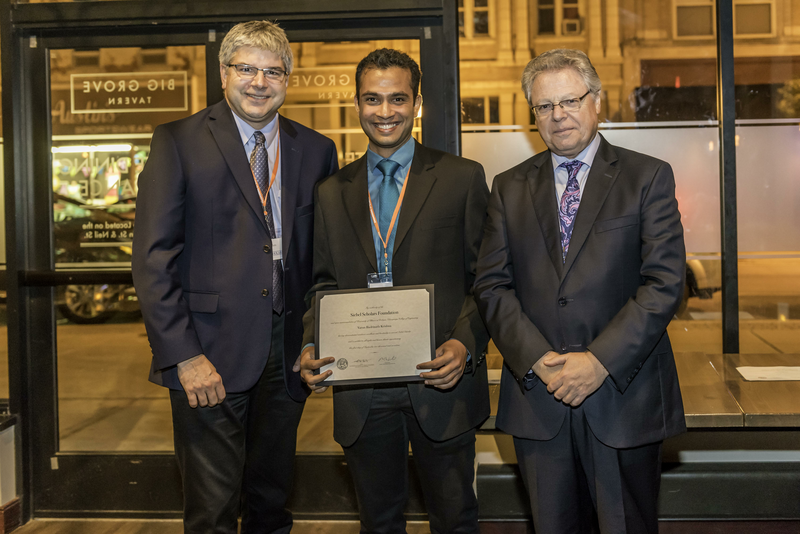 Krishna (center) with ECE Department Head William H. Sanders and Dean of Engineering at Illinois Andreas Cangellaris. Krishna had always been excited about creating technological solutions to problems that he cared about. He initially got into energy systems research because he wanted to improve the efficiency of those systems so that their carbon footprints could be mitigated. In order to do so, he did research on the “smart grid,” which uses network communications and intelligent controls to improve efficiency. However, he realized that such efforts to improve efficiency could be undermined by cyber adversaries who could compromise those network communications. Krishna added, “It’s similar to how cars have now become 'smart,' at the cost of becoming increasingly vulnerable to cyber attacks. While I still work on improving the efficiency of energy systems, the primary focus of my PhD is on detecting and mitigating attacks on controls and communication networks in power grids.” Krishna’s research is currently funded by the U.S. Department of Energy through the CREDC consortium. Today, Krishna is focused on improving the resilience of power grids to cyber attacks on power generation controls. When asked which research contribution he was most proud of, he said it was his work on mitigating electricity theft, which causes loss of efficiency and costs utilities billions of dollars in lost revenue. That work was funded by the Siebel Energy Institute and the U.S. Department of Energy. It won best paper awards at QEST 2015 and CRITIS 2015. Outside of technology, Krishna has made small contributions to increasing the adoption of solar power in Indian villages. He organized a campaign to raise micro loans for those villagers to help them replace kerosene lamps (which are polluting and inefficient) with clean solar power.